This open water bay swim is an annual fundraising event to benefit the youth USA swim team (“Sailfish”) program in the City of Richmond, based at the restored Richmond Municipal Natatorium (“The Plunge”). It is typically held at Keller Beach, Miller/Knox Regional Shoreline, in cooperation with East Bay Regional Park District (EBRPD) who will provides water safety and lifeguard services for the event. 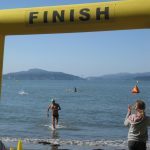 The event includes open water swim competitions for youth (ages 6 to 18) and adult swimmers, at ½-mile, 1-mile and 2-mile distances, wetsuit and non-wetsuit. 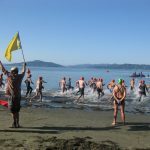 It is typically the final event of the Pacific Masters Open Water swim season. The proceeds from the event are used to provide scholarships to inner-city and at risk youth throughout Richmond, pool rental fees, training equipment, and coaches’ salaries. Since 2010 over 350 children have learned to swim with our swim team and grant funded swim lesson programs. Sailfish swimmers are competing at local and regional swim meets, and give back to the community by volunteering their time at local events and participate in beach clean up day and clean Keller Beach. Our 9th annual event was swum on September 22nd, 2018. Thanks to all the swimmers, sponsors, and volunteers that made the event possible.